Confused about the meaning of a term such as “meplat”, “magnaflux” or “obturate”? Need to know the OAL of an unusual Wildcat such as the .218 Donaldson Wasp? Well CCI and MidwayUSA offer handy answers on the web. CCI’s Shooters’ Glossary is a very complete collection of gun-related and reloading terms. MidwayUSA’s GunTEC Dictionary contains short descriptions of hundreds of cartridges, plus definitions of thousands of shooting-related words and phrases. How many of you knew that “Maggie’s Drawers” is “a colloquial term used for the red flag once used by pit workers to signal a missed shot at high-power rifle competitions”? Share the post "Gun Glossaries Explain Tech Terms"
The National Shooting Sports Foundation (NSSF) announced the launch of its new online NSSF Marketplace Buyers Guide. 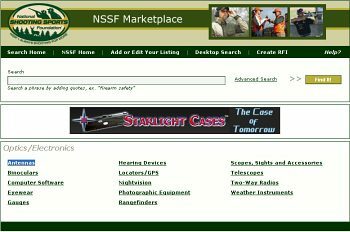 Available on NSSF’s Web sites, this directory allows shooters to quickly locate specific products and services by keyword or category. The NSSF Marketplace employs a powerful search engine that continually indexes the Web sites of all companies represented in the directory. The Marketplace has both keyword-search capability and dozens of links for specific product categories such as ammunition, optics, cleaning gear, and guide services. Click on “Optics/Electronics”, for example, and a page appears with linked subcategories for Scopes, GPS units, Rangefinders, Eyewear, Binoculars and more. The NSSF Marketplace also offers a downloadable desktop search application. If you install this, you can search for products and services directly from a small search window on your desktop. The NSSF Marketplace also includes a Request for Information (RFI) tool, enabling users to contact a group of suppliers with one click of a button. The buyers guide can be found on www.nssf.org and other association-supported sites, including www.huntandshoot.org, www.wingshootingusa.org, www.wheretoshoot.org, www.huntinfo.org and www.stepoutside.org. Share the post "NSSF's New Online Product Database"